CHARLOTTE— Rodney Bullock and Kyron Cartwright were determined to have one more NCAA Tournament run. The Providence seniors experienced heartbreak in last year’s first four vs. No. 11 seed USC and would get another shot this year as a No. 10 seed. A different year, but the same result for the Friars as the No. 7 seed Texas A&M powered their way to a 73-69 first round win in the first-ever meeting between the schools. The Aggies didn’t skip a beat after missing last year’s tourney, despite getting off to a slow start by going scoreless in the first 6:33 of the contest. Both teams struggled to find consistency through the rest of the first half with Providence down by one point, 28-27 at halftime. The back-and-forth scoring affair continued into the second half before Cartwright knocked down a jumper from the elbow, capping an 11-3 run for the Friars and bringing the game to a 50-50 tie with 9:06 remaining. 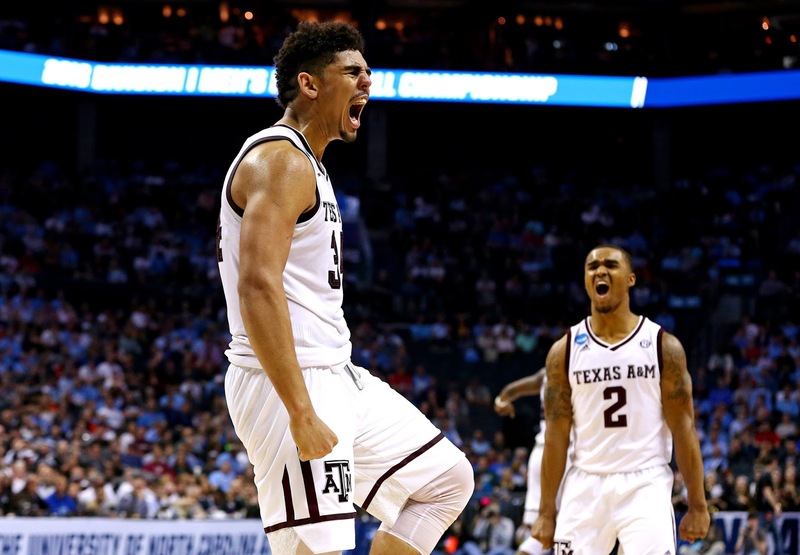 After Providence stormed back, there was no answer for Texas A&M's tandem of Robert Williams and Tyler Davis. The “tall towers” combined for nine of the next twelve Aggies’ points and pushed the first double-digit lead of the game, 62-52, with 2:37 left. Texas A&M extended their “five minute lead” streak to 20-1 on the season by scoring a total 20 points in that time. Davis came into the game shooting 57.9 percent from the field and averaged a team-high in both points (14.5) and rebounds (8.8). He finished with 14 points, 15 rebounds and two blocks on the day. Bullock finished his career at Providence leading all scorers with 22 points and five rebounds. The Friars had a total of three players in double figures with Alpha Diallo’s 21 points and Cartwright having 11 points. Providence shot 44 percent from the field (27-62) and a lackluster 30 percent from three-point range, falling below their season mark. Providence’s season comes to an end having lost their first tournament game in each of the past three seasons. The last time the Friars advance past the regional round was in 1997 with an elite eight loss vs. No. 4 Arizona. The NCAA announced in April of 2017 that Charlotte, N.C. would remain a host site for the first and second rounds of the 2018 tournament. All following the repeal of HB2, the state’s controversial legislation that allowed discrimination against the rights of the LGBTQ community. The state was in jeopardy of losing NCAA related championship events until 2022 and would’ve cost an estimated $3.76 billion in lost revenue over 12 years. In a similar move, the NBA stripped Charlotte being the host city for the 2017 All-Star Game due to concerns over HB2, before ultimately decided to re-award the weekend to the Queen City next year. Texas A&M advances to play the winner of No. 15 seed Lipscomb and No. 2 North Carolina on Sunday with a tipoff time TBD. The SEC is now a perfect 5-0 to start the 2018 NCAA tournament.